Ok, let’s move on to the tournament now! I had already judged in this shop a few times. We always had exactly 65 players. Talking with the TO, he set a nominal cap of 64 players to avoid one extra round of swiss, but would not deny a 65th to join the tournament, for the sake of customer service towards them (the shop can host up to 70 players). As soon as I was assigned as HJ for the tournament, I contacted the TO to find his expectations on attendance, and to decide on the staff. 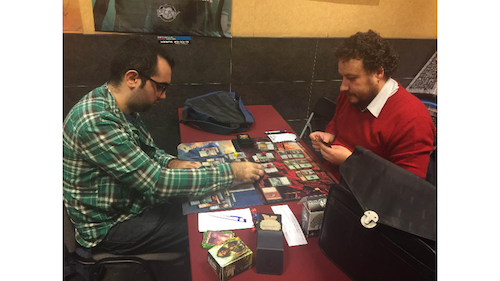 It was about two weeks before the event and there were many unknown variables: it is the beginning of the new PPTQ season after a break, and the shop usually runs modern tournaments (this was standard). It is also the first week after OGW release. The TO expects between 25 and 40 players. How many staff would you have looked for? 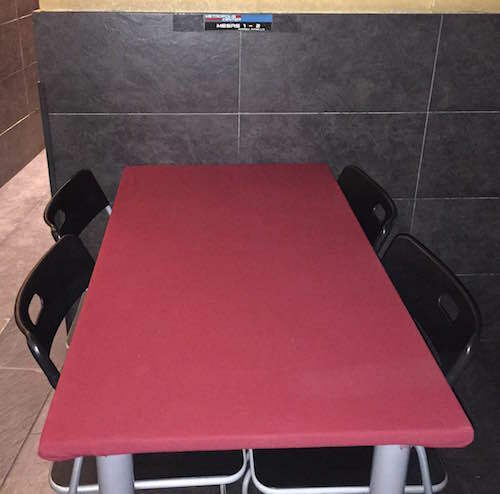 When I arrived at the shop, tables were already numbered, in a visible and clear way which couldn’t be obscured by players. However, there was not much space between adjacent tables and the whole venue only has one window. There are some fans, pointed away from playing tables to not mess with games being played, and an air conditioner in the main room, but as soon as the tournament began, some players started complaining about the high temperature, despite it only being January. Let the tournament begin! As soon as we put up the pairings for 44 players, a 45th player arrived and wanted to enroll. What do we do? In agreement with the TO, we allow him to enroll. However, we do not want to award him with a bye for his delay, neither do we want all the players to have to stand up and sit again for a new pairing. Therefore, we select a random player among all the 45 and we assign him/her a bye. If the selected player was the late one, well, he/she had the same opportunity as others to have the bye. Otherwise we pair the late player with the opponent of the random player and we just changed a single pairing. Side note: if the late player would change the number of Swiss rounds (e.g., he/she is the 33rd), we can actually change the number of Swiss rounds in the tournament only if we did not announce them yet, as per MTR 10.2. Once we dealt with the late player, I made my HJ speech once per room and made sure myself and the FJ synced up our times. I then let the first round start. We collected lists and made sure we had all of them and are ready for a Mid-Round Deck Check (MRDC) for round one. The FJ is not very experienced with DCs and the first one lasted 7 minutes. With some advice and some practice, we got it down to 4 min by the end of the day! ^^ If you need any help or advice for doing this procedure, you can find some useful suggestions here, here, and here. During the rest of the round (and thanks to the worthy advice of Antonio), we realized it would be better to redistribute players on the available space: the players sitting in the corners had to wait for several other tables to finish before being able to exit. We made sure with the TO that no side events will be run and that we can use all the available space, and we renumbered the tables as follows, including proper space for lists and DC. I announced a few times during the first rounds that we will have a break of about one hour, as the TO is used to it in his tournaments, but every time some players miss it. Despite the announcements, some players are surprised by the break when the time comes. Maybe next time it may be of help to stress it in the event advertisement as well (having a break is not a common practice in the other shops of the area). For the rest, the tournament runs smooth, in a nice and friendly climate. The star of the rulings has been Reflector Mage, no doubts about it! (What happens if I bounce a morph? and if I bounce a Purphoros, God of the Forge, can my opponent play it without devotion? and if I bounce an animated land? and a creature copying another? and if the mage dies, can my opponent play the bounced creature again?). Here we have some other interesting situations. Best wishes from Madrid and see you around! Asleep plays a Windswept Heath, breaks it, looks at his opponent who says “go”, searches for a Canopy Vista and the two players talk a bit about whether the tangoland should enter the battlefield tapped or not. Then, Asleep draws and plays a land. Juuuuudge! Asleep says that he intended the “go” of his opponent as if he was finishing his turn and passing back. What do we do? Anaesthesia plays against a Jeskai Ascendancy combo deck. Her opponent casts the frightening namesake enchantment and Anaesthesia decides to play Dromoka’s Command targeting her opponent to sacrifice an enchantment. Two turns pass, in which Johnny (the combo player), casts and resolves a Tormenting Voice and a Treasure Cruise. Then the two players realize that Anesthesia had no legal target for any of the other modes of the Command. Juuuuudge!! What do we do? Nemo controls an Anafenza, the Foremost. Albert controls a Catacomb Sifter and its Scion token. The token gets killed. Will Albert be able to scry for it?